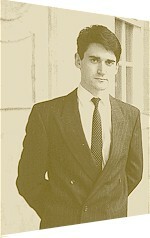 Alastair Revell founded Revell Research Systems in 1985; graduating from the University of Birmingham with an honours degree in Mathematics in 1988. He has worked extensively with computers and networks ever since. He is a Chartered IT Professional (CITP), which is awarded on the basis of peer assessment by the BCS, the Chartered Institute for IT. The institute is the only chartered IT body in the UK empowered to grant chartered status to IT professionals under its 1984 Royal Charter. He occasionally delivers Higher Education courses in subjects such as Systems Analysis, Software Development, Networking and Database Methods, which lead to awards from The University of Plymouth. He has also prepared chartered accountants (CIMA) for their final examinations. He has recently taken a major role in developing a new foundation degree programme in Internet Technology with Business, which will be awarded by Plymouth University from 2006 onwards. He is a former Devon Vice-Chairman and East Devon Chairman of The Prince's Trust, an organisation actively led by HRH The Prince of Wales, which helps disadvantaged young people in a variety of ways. Alastair Revell was born and initially educated in Exeter, before reading Mathematics at the University of Birmingham. He actually established Revell Research Systems in 1985 before going up to Birmingham. As an undergraduate, he worked on client projects during the vacations and academic assignments during term-time. He graduated with honours in 1988 and immediately set about establishing himself more firmly as a freelance consultant. He worked extensively for The Prince's Trust in a voluntary capacity at a senior level during the 1990s while continuing to practice as a freelance IT consultant. He served as the East Devon Chairman and Devon Vice-Chairman for much of the decade and contributed to the Trust's national IT policy as well as helping to establish The Prince's Trust Volunteers programme in Devon. Towards the end of the 1990s, Alastair Revell started to lay the foundations for establishing Revell Research Systems as a solid consulting practice - something more than just a name under which to practice as a freelance consultant. The practice has grown considerably since the start of the Millennium and now employs a number of support staff and associate consultants. CITP FRSA FIAP has wide ranging skills in management, computing and networking. He currently programs in both VB.Net and C#; and has used previous versions of Visual Basic and Pascal in various guises commercially. He has delivered training in these languages as well as C and C++ and is an avid evangelist for object orientation and, in particular, the .NET framework. He has worked extensively with a variety of database technologies, including Microsoft Access, SQL Server, ADO.NET and Transact-SQL. He is also a skilled systems analyst and designer, having developed numerous small and medium size systems. He has designed, delivered and led modules in Systems Analysis for undergraduates for over ten years and is well-versed in the SSADM 4.3 methodology. He has extensive knowledge of the Microsoft Windows operating system family as well as Microsoft Exchange and SQL Server, both as a software developer and as a systems engineer. He has strong network engineering skills and an in-depth knowledge of the TCP/IP protocol suite. He has delivered commercial and academic programmes on networking as well as working with a variety of network technologies on a daily basis. Outside of computing, Alastair Revell enjoys a range of other interests. These include a strong interest in English history, particularly in the period from 1066 to 1475. He undertakes a large amount of research each year in this field, working extensively with primary source documents at various archives around the country on a regular basis. He reads Medieval Latin and is reasonably skilled in palaeography. He also enjoys digital photography, which has moved from just an interest into a passion with the advent of digital SLR technology. He combines this with his love of walking, which often takes him on to both Dartmoor and Exmoor, as well as the coastal paths around the South West. He also ventures into the Pyrenees and Alps when the opportunities present themselves. He used to cycle competitively at club level, specialising as a hill climber, but has not done so for some time, although he still yearns to get back on his bike. There just isn't enough time...! Alastair Revell maintains a web log (a 'Blog') in which he keeps a journal of his thoughts on the IT Profession and various technical issues.